Rallt hammocks are light-weight, portable and able to hold up to 500 pounds. If you’ve ever been on Instagram then you’ve surely seen one of the millions of photos of people hanging out on portable hammocks in some of the most beautiful places on the planet. 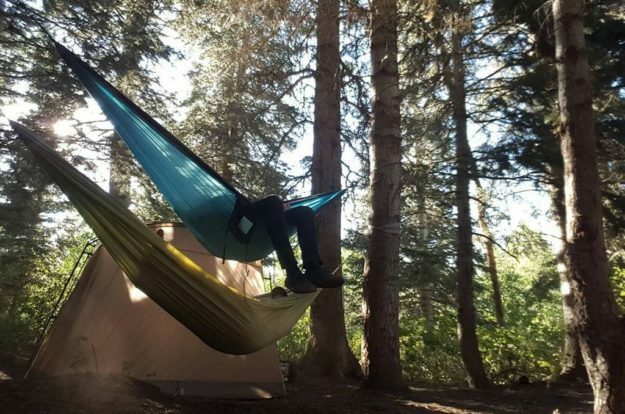 This new trend in portable hammocks has brought out many companies toting their product as the best hiking and light hammock to go camping with, or just for a day hanging at the lake. There is one brand though that stands out above the rest, Rallt Hammocks. Rallt Hammocks makes some of the lightest and most portable hammocks and hammock straps that will serve you well in any adventure. Rallt makes awesome outdoor gear that not only is ultralight and portable, but is also weather resilient and long lasting. It’s also insanely affordable. They make both single and double hammocks including one that comes in digital camo (definitely a favorite of ours). The single hammocks are 10′ x 4′ 7″ and are made with a single panel of ripstop nylon and no seams running down the middle. This is really important since it means that you won’t break the middle out when using it and fall while you’re taking a nap on a hike. The double size is 10′ x 6′ 2″ and is great for cozying up to someone or if you just want a little more room for yourself. The single hammocks can hold up to 400 pounds and the double up to 500 pounds. They are made with 70D ripstop nylon, which means that it’s a high quality material that won’t weigh down your pack. One of the issues with a lot of hammock brands out on the market is that you can buy the hammock but then you have to buy a ton of other accessories for it. With Rallt, you get 20 feet of nautical grade rope to hang it to the hammock straps with and aluminum wire carabiners. You also get an awesome stuff sack that you can hold everything in. When packed up, the single hammock weighs only 15.9 ounces and the double weighs 18.9 ounces. The Rallt Hammock straps are also a great investment. They will not only save you valuable time when you’re out in the wild, but will also hold you securely to the trees. These straps cost only $24.99 and can be had on their website here. They weigh less than a pound so they won’t bog you down either. You can purchase your Rallt ultralight hammock on their website here for $39.99 for a single and $49.99 for a double. If you’re interested in seeing more hunting gear and camping gear reviews, be sure to check back on MorningMoss. Gun shy dogs. Can it be fixed?